I can thank Colin Reed for the following information. In memory of Mr William Canning late of Quendon Street in the parish of Rickling, who departed this life March the ?? 1819 aged 63 years. (additional comment: I believe he died in 1775. He was married to Elizabeth and was the father of the William on headstone 5). Here lies the body of Elizabeth the wife of William Canning of Rickling in Essex late of Henham who departed this life Feb 12th 1770 aged 82 years. (additional comment: she was the wife of the William on headstone 2). (additional comment: she was probably the wife of the William on headstone 5). To the memory of William Canning ?? who departed this life the 11th of September 1766 Aetatis suae 48 Memento mori. (additional comment: he was the father of the William on headstone 1, and he married Ann Cole). In memory of Mr John Canning who died the 29 of January 1799 aged 42 years. Also of Mary Ann Canning who died the 8th of July 17?? 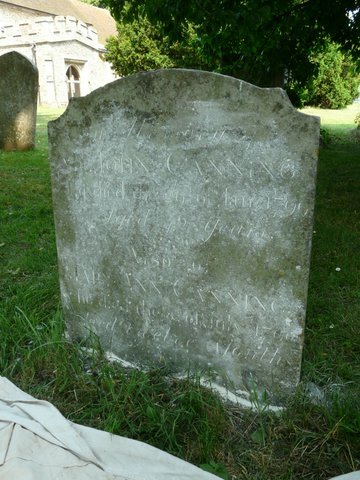 (additional comment: John Canning was the son of the William on headstone 5, and he married Mary Guiver. 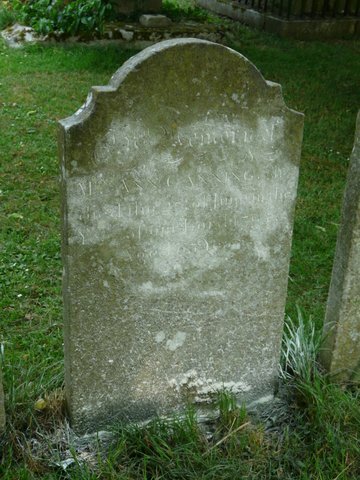 I cannot be sure about Mary Ann – William and Mary (see headstone 5) had a daughter Ann Canning, born 1763, and it could be her (in other words, John’s sister)). (additional comment: I believe this to be Mary nee Guiver, the widow of John Canning). In memory of Ann Canning late of Elsenham daughter of William Canning who departed this life October 21 1811 aged 31 Years. (additional comment: this lady is probably the daughter of the William on headstone 1 – though I thought she was born in 1777. Perhaps I misread her age on the gravestone).